Mme Ren Junod, La Chaux-de-Fonds; sale, Christie's, London, 1 December 1986, lot 14. Anon. sale, Christie's, New York, 10 May 1989, lot 47. F. Daulte, Alfred Sisley, Catalogue raisonn de l'oeuvre peint, Lausanne, 1959, no. 521 (illustrated). 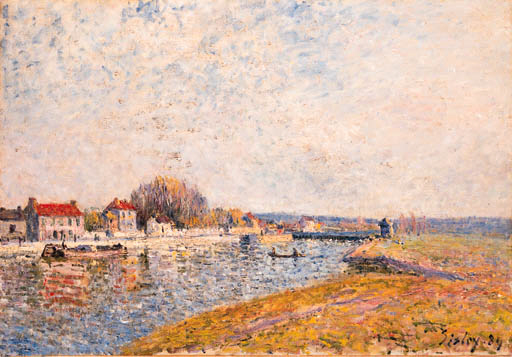 Sisley settled in Saint-Mamms in the autumn of 1883. This small village and the nearby junction where the Canal du Loing meets the Seine provided the artist with subjects for nearly fifty paintings during the 1880s. In Le barrage, canal du Loing Saint-Mamms, the artist looks across the glistening waters from the west bank towards the customs house and buildings along the river. Sisley draws the viewer toward the horizon with the strong orthogonals formed by the river's edge, guiding the viewer to a luminous sky that fills much of the canvas. Rich brushwork embodies the celestial activity with the same energy as the town and river below. John Constable (1776-1837) commented, "The sky is the 'source of light' in nature -- and governs everything" (quoted in ed. M.A. Stevens, Alfred Sisley, exh. cat., Royal Academy of Arts, London, 1992-1993, p. 11). Sisley similarly explained, "Objects should be rendered with their own textures and above all they should be bathed in light as they are in nature. This is what we should be striving to achieve. The sky itself is the medium. The sky is not simply a background: its planes give depth (for the sky has planes as well as solid ground), and the shapes of clouds give movement to a picture. What is more beautiful indeed than a summer sky with its wispy clouds idly floating across the blue? What movement and grace! Don't you agree? They are like waves at sea, one is uplifted and carried away" (quoted in V. Coudrey, Alfred Sisley: The English Impressionist, Exeter, 1992, p. 68).